When you're doing EC with your baby you're gonna need to know how to determine when your baby needs to pee. In potty training language, this could be considered your baby's "PeePee Dance." Why more complicated than just a Dance? Well, that's because we're dealing with young infants here (ages 0-18 months)! And although they are constantly communicating, it does come out in their own unique little language. And sometimes that's not enough...sometimes we can't see or hear any signals at all...so we'll need to call in all the options. So, how best to know when it's time to pee? 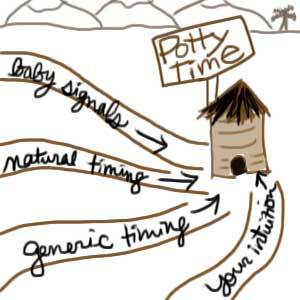 Here are 6 sample scenarios to help you see what leads to potty time. #1 is about Signaling, #2 about Natural Timing, #3 shows a combination of both Signaling and Natural Timing, #4 is about Generic Timing, #5 is about Intuition, and, finally, #6 illustrates a combination of Intuition and Natural Timing. 1. So you’re sitting around and your baby is playing nicely, and all of a sudden she gets grumpy and starts crying. That’s a Signal you’ve come to know and you see if she needs to potty. 2. Your baby is playing nicely after you fed her. It’s been about 10 minutes and you know she usually needs to go by now. You offer her the chance to potty, knowing her usual Natural Timing. 3. You fed your baby 10 minutes ago and she is playing nicely until all of a sudden her energy shifts, she gets a bit grumpy, and she starts crying. You put the two together: (a) she just ate (Natural Timing), and (b) she is Signaling you. You offer her the potty. 4. You are about to transfer your baby from the baby carrier to the carseat after grocery shopping. You offer her a pottytunity first (based on Generic Timing). When you get home 15 minutes later, you offer another pottytunity upon getting her out of the carseat (also based on Generic Timing). 5. You are carrying your baby around the house without his diaper on, when all of a sudden you feel warm and wet...as if he’s soaked you! You move him to the other hip and find yourself to be completely dry (this was a “phantom” pee...a.k.a. Intuition). You offer him a pottytunity and he goes! 6. You are cooking dinner and have the thought “the baby needs to pee” (Intuition). It’s been about 20 minutes since she last breastfed, which is her usual time to potty (Natural Timing)...but the thought “the baby needs to pee” keeps nagging you (Intuition) til you decide to leave the stove and offer the baby a Pottytunity. Voila! She pees. Remember: These 4 events may shift over time...with every miss and every catch, remain open to change & evolution. Hope you all enjoyed these role plays and now have a better understanding of what it might look like when your baby needs to pee! IF one of the above situations happens to you, you can test out EC to see if it's right for your family! See my EC videos for some more hands-on examples. So...do you have an example of "how you know when your baby needs to pee" that comes from your own life? If so, please leave your favorite one(s) in the comments, below! My daughter woke up with a dry diaper a few weeks ago (she is almost 1 year) and I decided to put her on the potty and I was so surprised when she peed. I have started giving her the opportunity to use the toilet each morning and she goes about 90% of the time and sometimes poops too. I couldn’t believe it. I would like to venture into other times of day but wasn’t sure how to get started. This post is really helpful – thank you! On Oprah, they talked about the sounds babies make before they have to go (plus what other noises mean). Thanks for your info. Check out my experience as a daddy with phantom peeing. Hey Shawn! Thanks so much for sharing your post…I found it endearing and quite silly. :) So glad you’re engaging on this level with Babbytom!!! made me so much more aware of my baby’s body language. Thanks Andrea for your help in getting us here!